Note: This post was written by Kevin Bailey. An interesting topic of discussion within the roundnet community revolves around the debate over which region is the strongest in the sport, or the way I like to word it: what is roundnet's "regional hierarchy"? There are great teams and great players representing each region. Nationals was certainly a testament to that, as the final four featured at least one player from each region. Yet, outside of the results from the Nationals Premier Division bracket, is there another (hopefully more accurate) way to determine which part of the country actually produces the best group of roundnet players? As the 2017 season came to a close, I decided to take a closer look at this question. What started as a simple observation of the postseason Power Rankings ended up turning into much more than that, as I went back and examined each power rankings list since the start of the 2016 season. How did I use these rankings to determine which region was the best? I used two separate methods (one much more accurate than the other in my opinion). But let's explore them both. 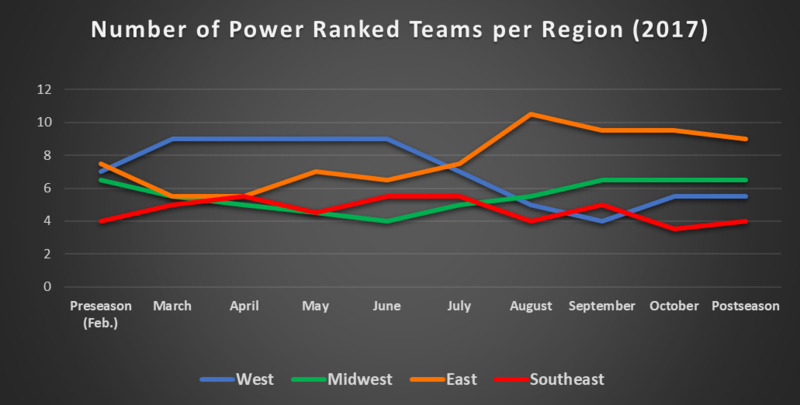 The simplest way to analyze regional distribution within the Power Rankings was to simply track how many teams were represented per region in the top 25. I awarded each region one point for every team in the top 25 that was located within their boundaries. If a team was comprised of players from two separate regions, I simply gave half a point to each. Below are the results for the postseason power rankings using this method. I then wanted to see how these results shifted over the course of the year. As it turns out, there were plenty of changes throughout the 2017 season. There was not a consistent order throughout the year. Every region's representation on the Power Rankings changed as the 2017 season went on. I was surprised to see just how much the West's representation in the rankings fell over the course of the 2017 season, compared to an impressive improvement by the East Region. The Southeast Region is often considered the weakest in the sport of roundnet. 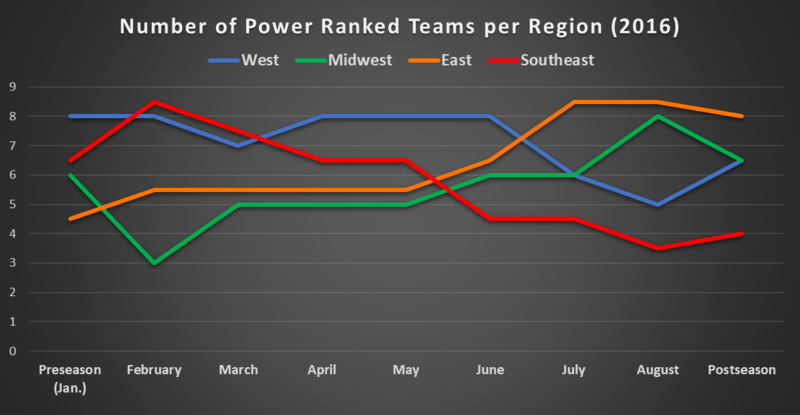 While the Southeast did start and end the year as the fourth best region according to this measurement, there were a handful of months where a different region held fewer spots on the top 25 list. Both the West and Midwest found themselves alone at the bottom for at least one month in 2017. Now, time to take a look at the 2016 season as well. The Power Rankings were not consistently published at the start of each new month, which they were in 2017. There was no Power Ranking for the month of September. The break between the rankings (posted in late-August and after Nationals) is too large for there to be no data. Ideally, we would have had at least one list during this time to bridge that gap. The first thing that jumps out at me is the massive decline of the Southeast Region from preseason to postseason. At the same time, the East Region enjoyed a fairly steady improvement, finishing the season as the top region in the country. The West Region performed similarly to how they performed in 2017, hovering near the top for most of the season but declining around mid-summer. Looking at these two seasons, it is easy to see that the depth of the East Region is the best in the country. This method is an extremely simple way to look at this issue - it is not the most accurate way to measure the strength of each region in my opinion. Basing regional strength on the number of teams represented on the top 25 list isn’t effective because it treats every position within the top 25 rankings as equal. There is no consideration given to where a team sits in the standings. Each Power Ranking orders the top 25 teams in the country. I assigned a point value for each position in the top 25. Being ranked #1 was worth 25 points, #2 was worth 24, all the way down to #25, which was worth 1 point. From there, I added the point values of each team in a certain region to find the total points earned by that region as a whole. Again, some teams are comprised of players from differing regions. For these situations, I awarded half of the team’s point total to each region that the team represented. For instance, Cisek/Showalter being ranked #1 would give the Midwest 12.5 points and the East 12.5 points, rather than awarding one region the full 25 points. To help visualize this, here is a breakdown of the 2017 postseason power rankings. Once again, we will start with the results from the recently released postseason power ranking list (shown above). When only counting the number of teams in the top 25, the Midwest slightly edges out the West. On the contrary, once we adjust for the order of the teams in the top 25, the West Region has a huge advantage over the Midwest. The Midwest Region may have slightly more teams on the top 25 list, but the West boasts 3 of the top 4 teams overall, giving them a significantly higher point total. Let’s also take a look at how things shifted over the course of the 2017 season. 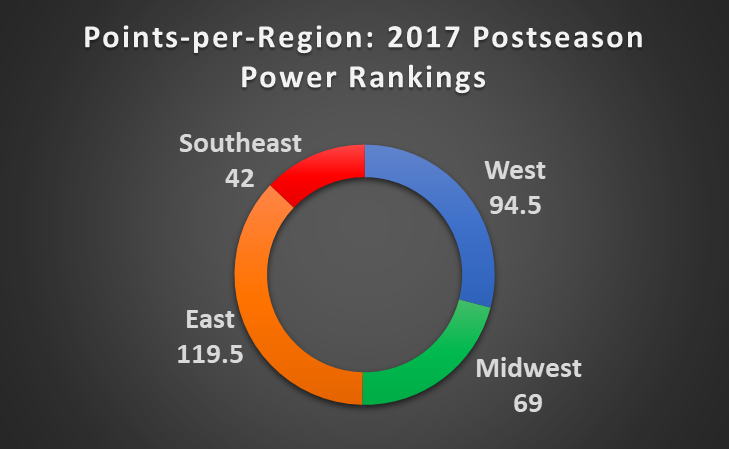 The Southeast Region had some slight ups and downs throughout the year but was never able to climb out of its place as the fourth strongest region. This is not consistent with results from method 1, which means the Southeast doesn’t have enough teams in the top of the rankings. The West Region’s decline in the latter half of the season and the striking improvement by the East Region is consistent between the two methods. After using this method to measure regional strength for this year, I went back and did the same for 2016. 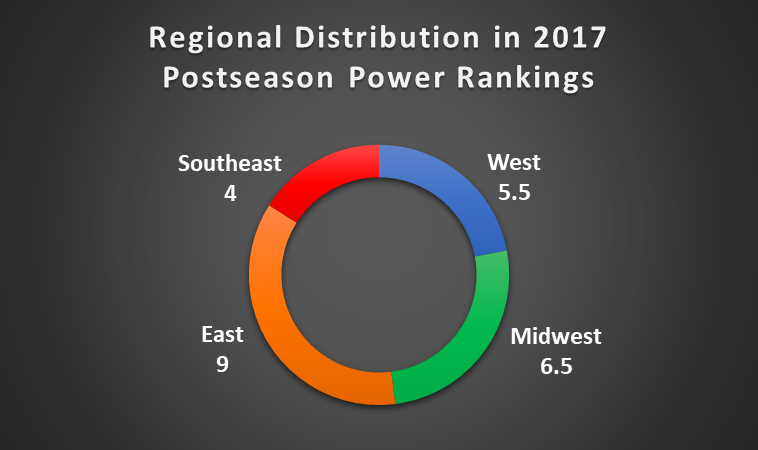 The 2016 season shares a few similarities with 2017, in that the West Region was on top for most of the year and the Southeast Region was the weakest of the four regions. One difference between the two seasons is that the West finished the year on top in 2016. The 2016 data also reveals how poor the Midwest was in the early season, but how it also improved gradually throughout the spring and summer before finishing the year as the #2 region. Finally, now that we have the method #2 results for both 2016 and 2017, here is a graph combining the two seasons. One last thing to consider when sifting through all of these results: The Spikeball Tour Series schedule may have an effect on how each region fares from month-to-month. The West Tour generally spans February to May, the Southeast Tour from March to June, the East Tour from April to July, and the Midwest Tour from May to August. This inconsistency over when official Spikeball Tour Series events take place within a region certainly will impact how active teams from that region are. 1. The West Region tends to thrive during the early months of the season (when their region is more active than others), before a steady decline over the summer months of June, July and August (when the West Region is the least active). 2. The Midwest and East have a tendency to gradually increase in point value during the summer months. Once again, this is thanks in part to the increase in Tour Stops in their region during this time. For those curious, here is a Google doc with all of the data I used. This includes every Power Ranking for both 2016 and 2017. One thing that you will notice is just how top-heavy the West is compared to other regions. By method #1, West is very inconsistent when it comes to the number of teams in the top 25, but this region was strikingly consistent at having at least 3 teams near the top of the rankings. As someone who is fairly new to the sport, it was fascinating to investigate which region was the best in the sport of roundnet. I went into this predicting the West was easily the strongest, but my results did not exactly match up with that assumption. After reviewing all of the above results, it’s safe to say that as of the end of the 2017 season, the East Region is the best in the sport of roundnet, thanks in large part to their staggering depth. The question now arises, which region will be the best in 2018? Will the West regain its footing, and claim the title of the best region in the country once more, or will the East continue to rise, and become a dominant region themselves? Maybe the Midwest or Southeast will be the region that makes the greatest strides in 2018. It’s hard to predict outcomes for next season, but I look forward to seeing how everything plays out.